Originally posted: April 11, 2018 . Last modified: November 29, 2018 . 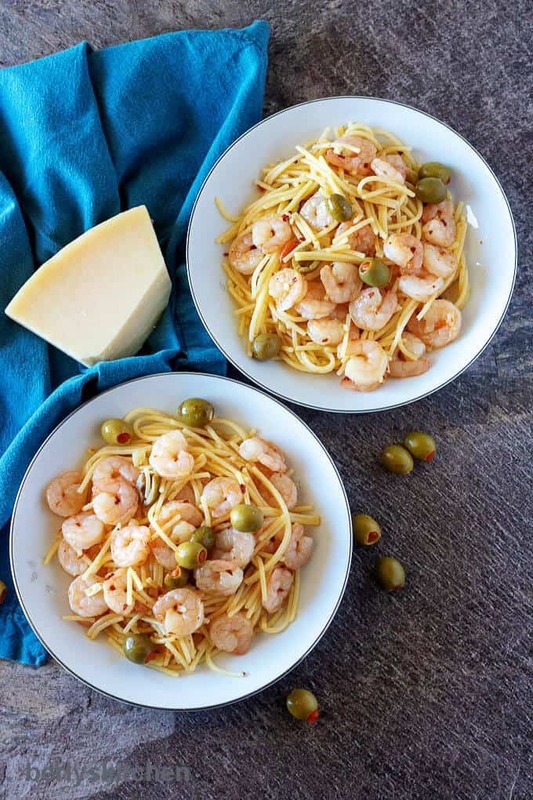 Tender shrimp, garlic, and olives make this shrimp and pasta recipe light and flavorful. This simple, yet irresistible dish is done in less than 30 minutes. Pasta has always been a staple in our house. If you took a peek into my pantry at this very moment, you’d find no less than five different boxes of noodles. So, it should come as no surprise we’re always trying to find new, delicious pasta recipes. That’s how this dish came about. 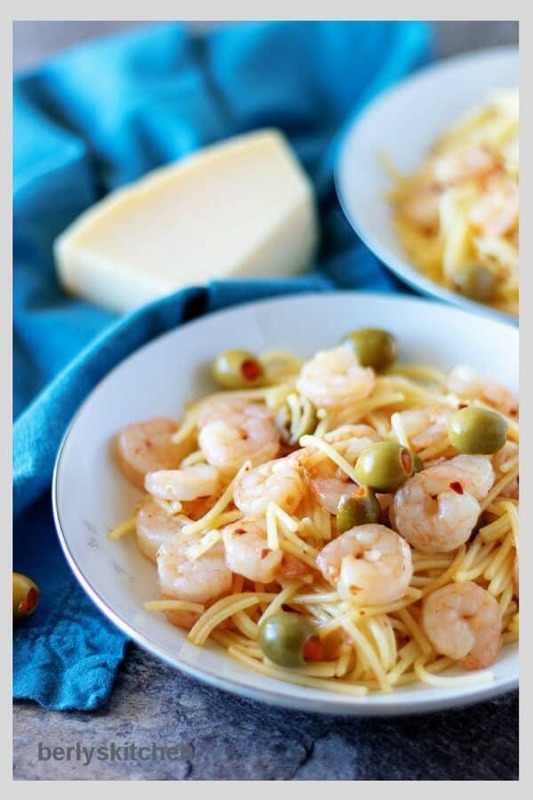 John was working at a restaurant and learned to make a shrimp pasta similar to this one. 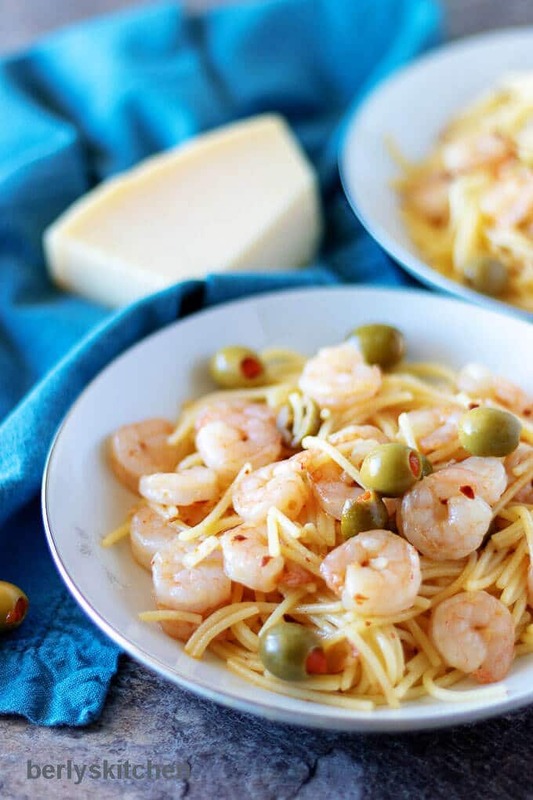 After a few modifications, our shrimp and pasta recipe was added to the repertoire. Now, we’re excited to share it with you and can’t wait for you to prepare it for others. First, cook the pasta according to directions on the box. I like to use long pasta like spaghetti, linguine, or angel hair. Be sure to cook it until al dente and drain reserving half a cup of pasta water. First, heat the olive oil in a saucepan over medium heat. Then, add the garlic, salt, and red pepper flakes. Next, cook for mixture 1 minute until the garlic is tender and becomes fragrant. Now, add the shrimp and continue cooking for about 1 to 2 minutes on each side. The sauce is ready! 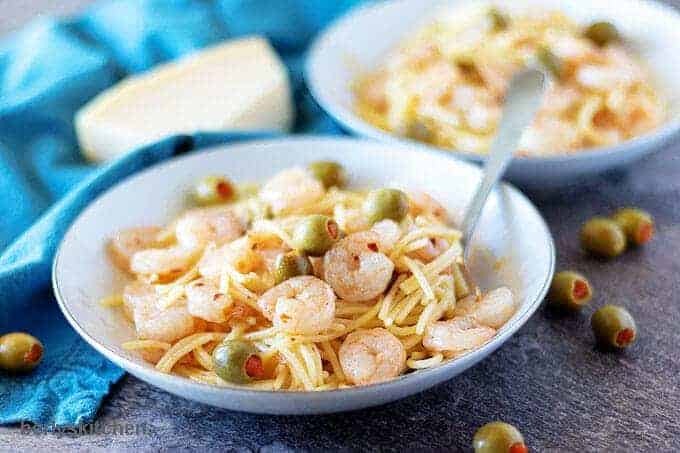 Begin by removing the pan from the heat and add the cooked pasta and chopped olives to the sauce and shrimp. Then, toss ingredients together to combine. Add reserved pasta water one tablespoon at a time if pasta is too dry. Last, serve immediately and enjoy! Try garnishes like parmesan cheese and sliced almonds. Pair this shrimp and pasta with a side of sauteed brussel sprouts, roasted broccoli, or garlic knots made with a homemade dough recipe. Add chicken breast to create a flavorful shrimp and chicken pasta. Use a splash of white wine to deglaze your pan just before you add the pasta noodles. Serve the pasta with a splash of lemon juice for a fresh kick of citrus flavor. Want more pasta recipes? Try our Smoky Chipotle Chicken Pasta or Penne Alla Vodka. Cook pasta according to package directions. Drain and reserve about 1/2 cup of the pasta water. Heat olive oil in a saucepan over medium heat. Add garlic, salt, and red pepper flakes to the pan. Cook for 1 minute until garlic is tender and fragrant. Add the shrimp and cook for 1 to 2 minutes on each side. Shrimp will become translucent and pink when done. Remove from heat and add the cooked pasta and olives and toss with garlic mixture to combine. Add reserved pasta water a tablespoon at a time if the pasta is too dry. The calories listed are an approximation based on the ingredients and a 4-ounce serving of pasta. Actual calories may vary. Another great looking recipe from your kitchen! I love the addition of olives. I think I might throw a few capers in as well if I get a chance to make this. There is so much different recipes using pasta! 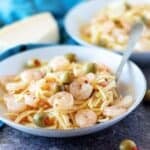 This looks great, I like that olives are included, but I don’t like shrimps (probably I would choose chicken). Looks and sounds great! It makes me miss the beach ? This looks so simple but at the same time authentic and unpretentious – amazing! 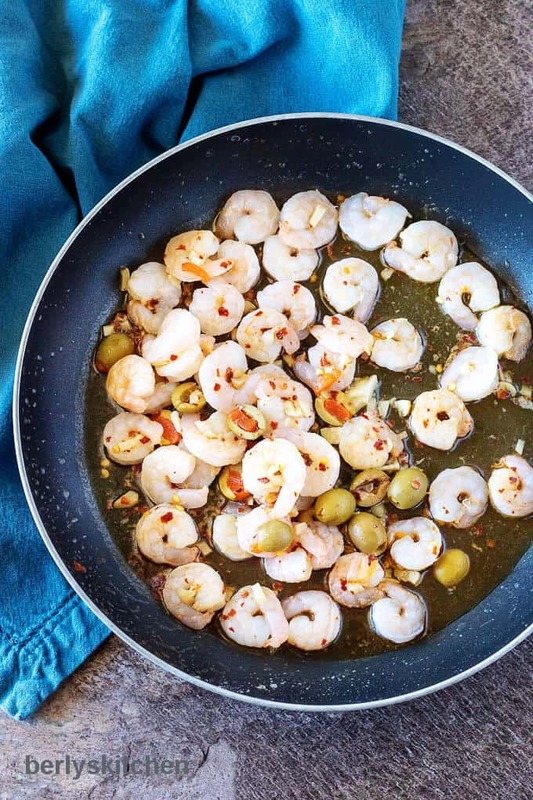 I love Mediterranean food, not so much shrimps but it’s just my personal taste. I love garlic pasta though. Great recipe! Pasta is my weakness! I love angel hair noodles too. This looks delicious! No doubts there 🙂 Have a great weekend Jenny! Oh my goodness, this makes me hungry! 😉 Love shrimp! I will definitely be trying this recipe! Love this so simple and full of flavor!! Thanks for the great recipe!! Yum! I would never think to add green olive but I bet it is delicious. Thank you, Chantal! 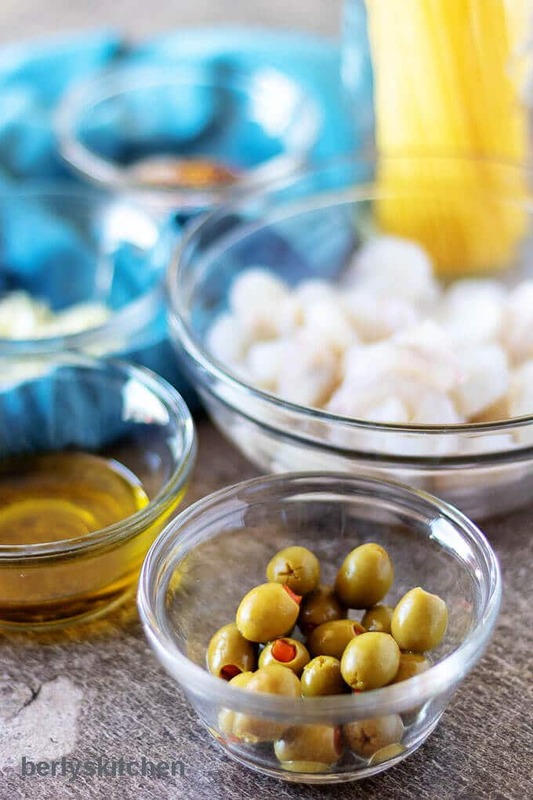 The briny flavor of the olives really cuts through the richness of the dish. It’s a nice contrast 🙂 Thanks again for commenting! I love simple recipes like this that are so flavorful and filling! Wonderful dish! This looks so good!! I love pasta! What a wonderfully easy meal. I love fresh, flavorful meals that come together so quickly! Looks and sounds great! I get tired of the red sauce and sometimes do pesto instead. I think this simple garlic and olive oil pasta would be delicious. Thank you, Aliza! Me too, there is only so much red sauce and pesto I can eat before it gets old. In addition to olive oil/garlic, we do a butter/garlic or lemon/basil and cream sauces.